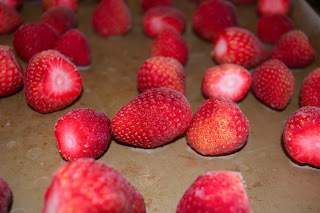 With our haul of strawberries this year, we decided to freeze about a third to use for smoothies and such later on. About half of them I froze whole while the other half I sliced up. Withe the whole strawberries, it's really nice to just grab a few frozen ones and not deal with a huge clump frozen together. To achieve this, I first cleaned and hulled the strawberries, dried them slightly and laid them out on a cookie sheet. 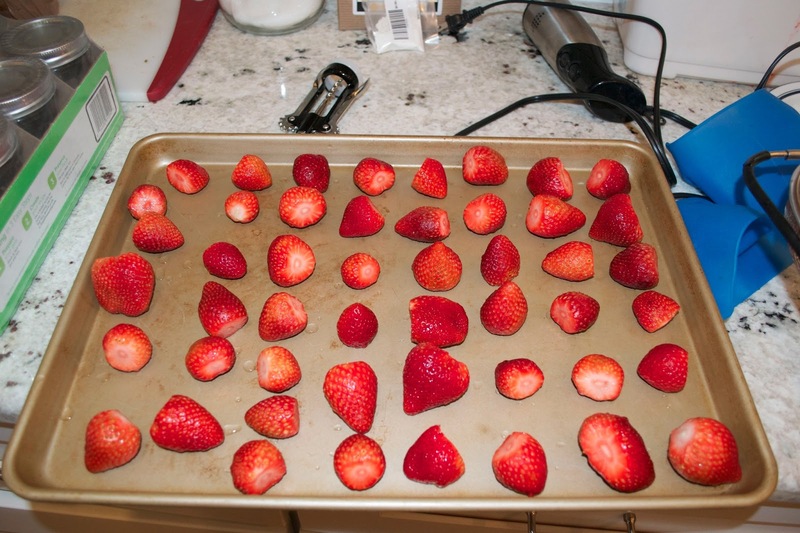 Then I stuck the cookie sheet in the freezer for a couple of hours until the strawberries were completely frozen. Once you have frozen strawberries, you can toss them into freezer bags and stick them back in the freezer. As long as you do this quickly (so they don't start melting) the strawberries won't stick together!